Exercise is an essential part of good health. Regular sessions of cardiovascular exercise make up the largest component of a weight-loss program because it can burn a lot of calories in a short amount of time. You have many options to choose from when doing cardio -- swimming and the elliptical trainer are just two. In general, you can burn more calories on the elliptical than you will swimming. If you want to lose weight you need to create a negative caloric balance. In other words, eat less calories than you burn on a regular basis. To lose 1 lb. of fat you need to burn an extra 3,500 calories. A combination of reduced caloric intake, along with increased amounts of physical activity is advised to lose weight safely and effectively. Aim to lose about 1 to 2 lbs. per week for long-term weight loss. Swimming offers a full-body method of cardiovascular exercise. You use both your arms and legs to propel you through the water. It is non-impact and appropriate for most people as a method of exercise. You can use different strokes, such as the breast stroke or the front crawl, which offer different challenges to your body and can alter the intensity of the exercise session. A 155-lb. 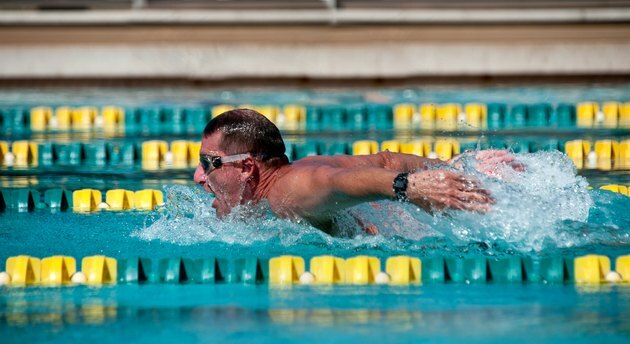 person can burn approximately 446 calories in one hour of swimming laps. The elliptical trainer is another versatile method of cardio exercise. Some ellipticals have movable arms to work both your upper and lower body, while others just use your legs. It is low-impact and comparable to walking on the treadmill with regard to stress on your joints. You can alter the intensity by adjusting resistance, pace or incline on the elliptical. A 155-lb. person can burn approximately 670 calories in one hour on the elliptical trainer. The biggest factor when choosing a form of cardio for weight loss is how challenging it is for you. If you are a swimmer, then the elliptical will make you work harder and help you lose weight more effectively. Your pace/intensity is also a factor. The calories burned in one hour are approximations. If you go slowly on the elliptical with a low resistance but swim fast, you will burn more calories swimming.